Emory swimmer Andrew Wilson won national titles in the 100- and 200-meter breaststroke at the U.S. Open Swimming Championships, a five-day meet that concluded Saturday. Emory swimmer Andrew Wilson won national titles in the 100- and 200-meter breaststroke at the U.S. Open Swimming Championships, a five-day meet that concluded Saturday in Minneapolis, Minnesota. In the 200-meter breaststroke competition, Wilson set a new U.S. Open meet record with a time of 2:09:73, according to Jon Howell, Emory swimming and diving coach. In the 100-meter breaststroke, he earned a personal best time of 59.51, which ranks him as third fastest in the U.S., behind American swimmers Cody Miller, who just won a bronze medal in the event this past weekend at the 2016 Summer Olympic games in Rio de Janeiro, and Kevin Cordes, who placed fourth in the Olympic final. At the U.S. Open meet, Wilson also received the “Phillips 66 Performance of the Meet” award for his outstanding performance in the 100-meter competition. The U.S. Open is a championship meet organized by USA Swimming that is open to international swimmers and teams. The weekend wins mark the second and third national championship titles that Wilson has earned. His sub-minute 100-meter performance at the 2015 Phillips 66 USA Swimming National Championship last August led him to be dubbed the “breakout breaststroke star of the U.S. Nationals” in Swimming World magazine. One year later, the U.S. Open proved to be “a great meet for him, an opportunity to compete for another national championship,” Howell says. “Being ranked third in the U.S. right now also puts him in better standing to gain a spot on the World Championship team in December," Howell explains. Last fall, Wilson announced that he was taking a year off of his studies at Emory to train with Longhorn Aquatics at the University of Texas at Austin in preparation for the 2016 Olympic swim trials. Earlier this summer, Wilson was among four Emory students to compete at the U.S. Olympic trials in Omaha, Nebraska — a record number of qualifying students for Emory. At those trials, Wilson placed in the top five among the nation’s elite swimmers in both the 100 and 200 breaststroke finals. Wilson placed fifth in the 100 breaststroke finals with a time of 59.97 and fourth in the 200 breaststroke with a new long course personal best of 2:09:35. The top two swimmers in each race made the Olympic team. 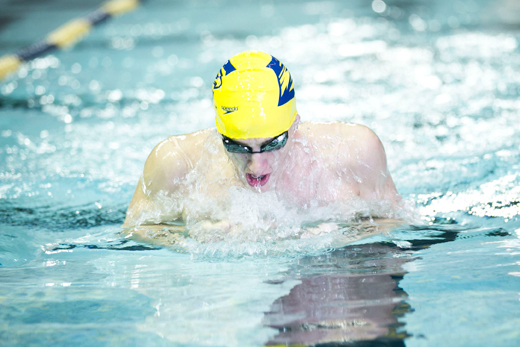 Wilson, who is majoring in physics and applied math, is now in the process of moving back from Texas, where he will pick up his studies at Emory this fall and conclude his senior year swimming for the Eagles. “He’s got big goals — it’s part of what has fueled him. We both believe he can go even faster. He’s not too far off an American record,” he says. “This could be an interesting year for him. It will be exciting to see what it brings."